Small children tend to go through phases of picky eating. Try to offer a wide variety of fun, nutritious choices. Don't force your child to eat. 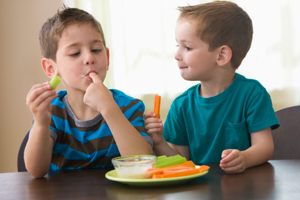 Don't restrict fat in the diet of children younger than age 2. Most children need whole milk from ages 9 months to 2 years. If you are not breastfeeding and do not want to give your child cow's milk, give your child soy infant formula until your child is age 2. After the age of 2, you can serve low-fat milk or fortified alternatives. Ants on a log: Celery stick stuffed with peanut butter and topped with raisins. Pretzel pops: Cubed cheese on a pretzel stick. Smudgies: Blend 1½ cups milk with ½ cup peanut butter and 1 package of instant pudding—chocolate or vanilla. Beat well, then let stand for 5 minutes. Spread filling ½-inch thick on graham cracker square. Top with another graham cracker square and then freeze until firm—about 3 hours. Makes 12. English muffin pizza: Halve an English muffin, spread pizza sauce on top, sprinkle with cheese, then bake at 180°C (350°F) until cheese melts. Bagel bites: Slice flavoured bagels thin, like coins, and place on a baking sheet. Spray them lightly with olive oil and bake at 200°C (400°F) for 10 minutes. Fruit milk shake: Blend together ½ cup strawberry or vanilla yogurt, ½ cup frozen strawberries (frozen without added sugar), and 1 teaspoon lemon juice. Health Canada, et al. (2014). Nutrition for healthy term infants: Recommendations from six to 24 months. Health Canada. http://www.hc-sc.gc.ca/fn-an/nutrition/infant-nourisson/recom/recom-6-24-months-6-24-mois-eng.php. Accessed April 28, 2014.